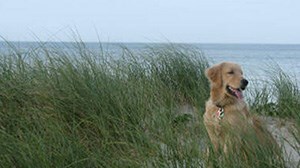 Having lived on the Cape for almost 20 years, my family and I consider ourselves residents. But there are times when our friends and family come for a visit and we again feel like “wash ashores.” We don’t always take time to visit the more touristy locations, events, and hang-outs, but when our family came for the Father’s Day weekend, we made a stop just over the Bourne Bridge to go on the Cape Cod Canal Cruise. The two-hour boat ride left from Onset, just outside Buzzards Bay, and took us and about 60 others on a fun-in-the-sun, fact-filled journey. The cruise boat The Viking has a capacity of 75 passengers and provides a very comfortable experience for young and old. My mom and dad are in their 80’s and told us time and again that this was one of highlights of their trip. 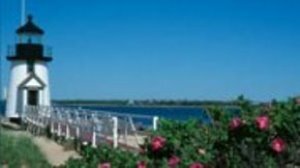 The ferry service provides live commentary about the fascinating history of the canal and its surroundings as you take in the beautiful scenery and the many commercial and pleasure boats that pass by in the busy waterway. Points of interest include the Mass Maritime Academy, the Vertical Lift Railroad Bridge and descriptions of the gigantic effort put forth by the Army Corps of Engineers to build and maintain the canal since 1928. The Bourne and Sagamore bridges are pretty remarkable by car but look even more impressive when you float slowly underneath and marvel at these engineering feats. There is plenty of room to move around the two covered decks, and there are snacks and beverages, including beer and wine. I would suggest getting to the dock early enough to find a parking place, especially on good beach days. The pier is next to a public parking lot in the village of Onset and it can take a while to scope out a spot. 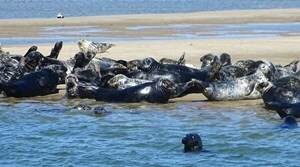 Our whole family agreed that it was well worth the $15 ticket price, and was a great day on the Cape Cod Canal. See Hy-Line Cruises for times and details about cruises for the whole family or for sunset cocktails or live music cruises. 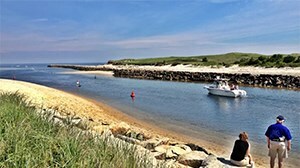 You can check out the Cape & Islands Vacation Planner for more great boat cruises around the Cape such as Bay Spirit Tours in Hyannis, and Beachcomber Boat Tours in Chatham.